It’s been hard to feel sympathy for Gearbox Software as of late, what with its recent track record consisting largely of an insufferably self-satisfied co-op shooter and a series of fan-angering whoopsies it insists on valiantly defending, but if you ever wanted to feel sorry for a triple-A game developer—something that people on various unnamed forum boards seem to find incredibly easy for some reason—imagine what it must’ve been like in 1999 when the freshly-formed studio was approached by Valve to take on the daunting task of making Half-Life expansions. Just hold onto that prospect for a moment. Imagine Gabe Newell walking into your office lobby, amidst piles of empty cardboard boxes and discarded packing materials, and asking you to follow up one of the most phenomenal first-person shooters of all time with a side-story or two. I’d panic. No wait, I’d write an elaborate cringe-inducing fanfic where the G-Man has to use his extradimensional powers to thwart the alien invasion and save crucial characters fated to die. Fortunately Gearbox kept their heads and we were blessed with Opposing Force, an expansion pack that fared about as well as anybody could’ve possibly hoped, if not better. Alright, it trod familiar ground in more ways than one, and towards the end it swan-dived so hard it’s a wonder that the final boss didn’t just give up and sulk off the stage midway through the fight, but it had some wonderfully memorable moments and when all’s said and done it’s hard to turn down six more hours of Half-Life goodness, whatever the source may be. It even managed to effectively expand on the idea that the HECU marines were really just as out of their depth as everybody else caught up in the Black Mesa incident, even if it had to fabricate an entire internal conflict just so you’d have some hitscan grunts to shoot at. 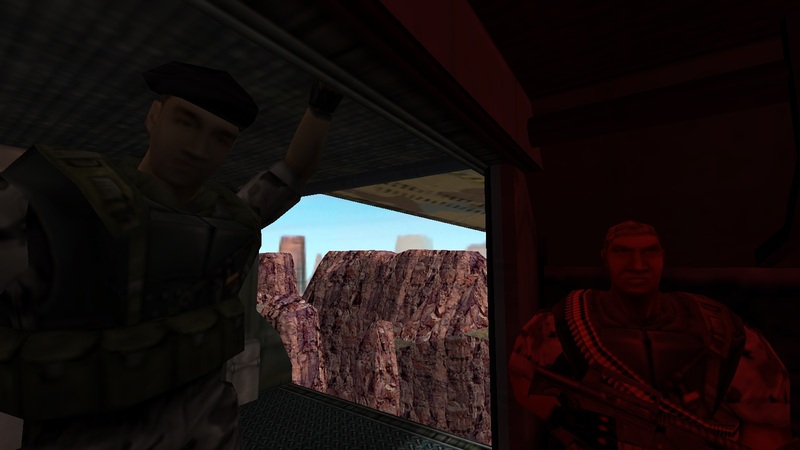 Erik Wolpaw—a man who might know a thing or two about Valve games, just a hunch—wrote that it “sets a new standard for quality for future action-game mission packs”, and while he was probably right, there are a couple of things Opposing Force does that nearly every expansion pack of the time was guilty of. The big one, which I’ve more or less made up on the spot here, is weapon indecision. Let’s put you in the shoes of somebody planning an expansion pack for a moment. Your goal is to feed new content into it while building off an existing set of systems and mechanics. If you’re lucky, that new content will integrate so seamlessly that people will unanimously agree that the base experience isn’t complete without your work; if you’re unlucky, you’ll end up like the F.E.A.R expansions on Steam, thrown in as a freebie that sensible people rightfully steer clear of. So, you start with a new story, with new areas to match. There’s a reason expansion packs were occasionally called ‘mission packs’ around this era, after all. Let’s put in some new enemies; people are probably getting tired of bludgeoning the same cloned headcrab zombie’s head in by now. Don’t worry about explaining away why they weren’t in the original game, I’m sure nobody could possibly get worked up enough about the canon to care. How about some gimmicks? Everybody loved waiting for an NPC companion to open a door for them, so let’s do that again with more wisecracking and standing around tapping your feet. Are we missing anything? Oh right, new weapons. It seems like a no-brainer, right? Everybody likes new toys, especially toys that let you play with pyrotechnics without endangering your fingers. Every FPS expansion pack worth its salt had them, and I’ve yet to see one that introduced them without tripping and face-planting on the blurry texture-mapped floor. It’s not that the weapons themselves aren’t effective, or that the games do a lousy job of introducing them; they just seem to muddy things up, either languishing unused or simply making the existing weapon set more and more unwieldy, with unpleasant results. Let’s look at Half-Life’s weapon system. 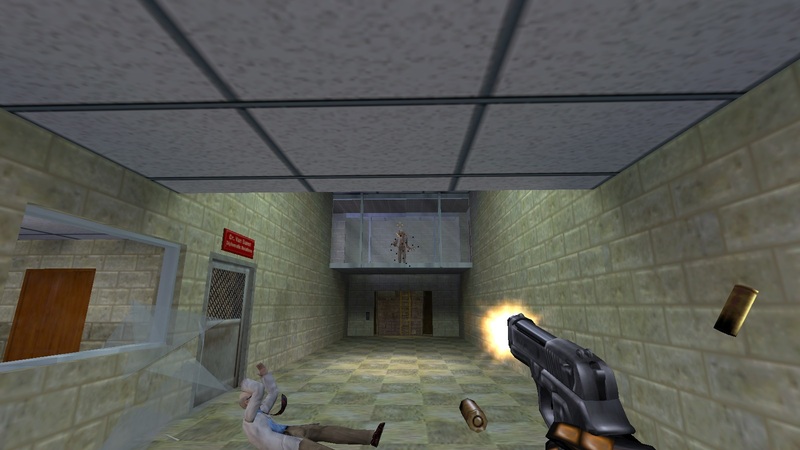 Like many first-person shooter protagonists in the nineties, Gordon Freeman set himself up for a lifetime of chiropractic sessions at a young age by carting around his entire arsenal at all times, a system that lost popularity with the introduction of more realistic—or at least, more controller-friendly—two-weapon systems only a few years later. What makes old-school weapon systems interesting is that you are—especially towards the end-game—theoretically perfectly equipped for every possible combat encounter. It’s not merely a case of “I have the most guns, therefore I can kill the most enemies”; the number of weapons you’re carrying isn’t nearly as significant as the flexibility they grant you. It’s not that you have enough weapons, but that you have at your disposal the optimal weapons for any situation. Consequentially, a major factor of the combat in any game with this system—Half-Life, Doom, Quake, Duke Nukem 3D—is in rapidly reading the current situation and making a snap decision on what weapon to use at that exact moment in time. If you’re reading this, you probably make those snap decisions unconsciously, but the reality is that you’re feeding an awful lot of factors into that decision. What combination of enemies are you up against? Is your target close or far away? Are they clustered together with others, or isolated? How urgently do they need to die? Are you in a position where you can choose your shots carefully? How much health does the target have, and what’s the most efficient way of dealing that amount in damage? What ammo can you afford to spare? How much damage are you willing to take? Do you even have the time to switch to the weapon you want? Out of that maelstrom of questions, many of which are solved at a glance, you make a weapon selection. It might not be the objectively, mathematically best selection, but chances are that it’s pretty damn close. And Half-Life? Half-Life serves up the most exquisitely balanced platter of weapons. Half-Life’s weapon set is a divine carpenter’s belt unrolling from the heavens, every murderous tool excelling at its own distinct role. What I mean by that is that there’s very little overlap between what the weapons are good at; there is, as the saying goes, a time and place for everything. Consider its range of explosives, for example: the satchel charge, the RPG, the hand grenade, the trip-mine and the MP5’s grenade launcher. Sounds a bit excessive, right? On the face of it, all of them are capable of dealing with clustered enemies or doing heavy damage to a single target, but each one has a unique application that distinguishes it from its peers: the grenade launcher leaves you less vulnerable than the RPG, which is more immediate and effective against flying targets than the hand-grenade, which is poorer at ambushes than the satchel charge, which requires you to babysit it more than the trip-mine. The consequence of every weapon having distinct applications like this is that there’s very little meaningless deliberation when making those snap decisions; for close-range heavy stopping power, you’ll leap to the SPAS-12, without endlessly dithering over whether it or another, similar shotgun would be better for giving the grunt around the corner the second-worst surprise of his day (the worst surprise being that aliens are real and have arms that shoot bees). Half-Life’s weapons allow you to be decisive, adapting to keep up with your rapidly changing surroundings, and it’s this adaptability—more than actual physical movement speed, though that certainly helps—that keeps the combat flowing. By the end of the game, this decision-making comes naturally; every enemy and encounter archetype has been exhausted, and it’s a trivial process to map the contents of Gordon’s rucksack to the challenges the game throws at you. Every fight is a series of multiple-choice questions, every answer is a gun, and you’ve been studying the material for twelve hours straight. It feels weirdly fulfilling to walk out of a room full of gently cooling bodies knowing that you took them out in what was probably the most efficient way possible, but the thing about this particular style of play—rapidly picking from a set of distinct weapon roles based on rules developed from prior knowledge and a handful of environmental factors—is that it puts anybody trying to expand on that experience in an awkward position. How do you expand on Half-Life’s near-immaculate weapon set? Where do you add things? Opposing Force tries a few tacks, and the result is like a Victorian London street urchin’s teeth, full of overlaps and gaps and sticky-out bits with no obvious purpose at all. Its arsenal might be only slightly larger than Half-Life’s—seventeen weapons to fourteen, hardly an unwieldy number—but it’s considerably messier to use. Some weapon roles overlap heavily, like the Desert Eagle and the sniper rifle—both effectively functioning as powerful accurate long-range hitscan guns—or the MP5 and the LMG, with the latter behaving primarily as a stronger version of the former with some fancy recoil. The hivehand has been supplanted by an electric blue cockroach thing, which has no real distinguishing features besides regenerating ammo—and thus, no obvious role at all—while the handheld lungfish-with-a-cold effectively combines two of your other explosive archetypes into something with greater single-target utility, which isn’t really much of a distinction. In other words, there’s now quite a lot of redundancy in Adrian Shephard’s kit, and that spells trouble. 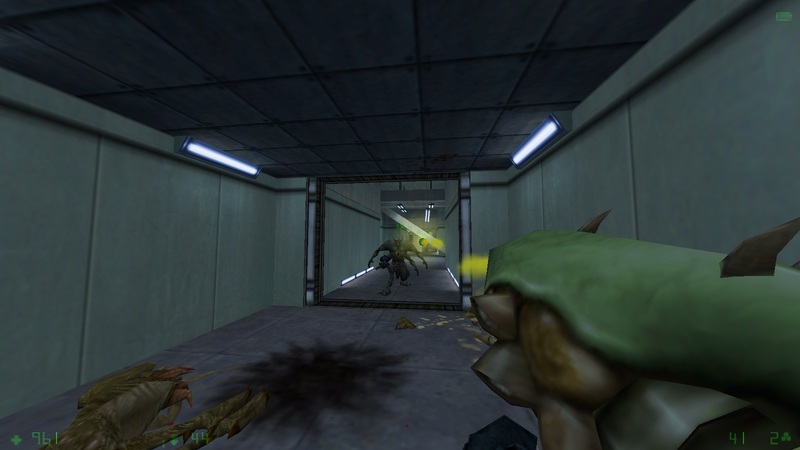 Rather than facilitating decisiveness, weapons that serve similar purposes only add precious moments of dithering, cutting into the flow that made Half-Life’s more discrete combat encounters such a joy in the first place, and forcing choices to be made based on disinteresting factors like ammo availability or even arbitrary preference. We already have our own set of rules for how to use Half-Life’s weapons to their utmost potential; our own set of answers to the combat’s questions. Adding new potential answers to the same questions just makes it harder to circle A, B, or C. This is the rake that countless expansion packs have trodden on, and Opposing Force, bless its heart, treads heavily. But all is not lost. Opposing Force fights the problem of weapon indecision when it goes places Half-Life never went; when it introduces entirely new kinds of challenges, and new weapons that excel at dealing with them. For the most part, Race X is a series of recycled archetypes blended together with disparate visual designs—the Shock Troopers are Alien Grunts that can’t chip away at you from around the corner, the Pit Drones are sharing a desk with the Houndeyes in the “swarming knee-high cannon fodder” department, that sort of thing—but one recurring enemy type Half-Life never had was an aggressive damage-soaking bully with an electrical area-of-effect and a face like the bits of a chicken that get left on the chopping board. Enter the Voltigore: a lumbering monstrosity that clumsily galloped out of Gearbox’s minds and into the more forgiving parts of my heart. The thing about encounters with the Voltigore—especially in the cramped, dark maintenance tunnels where it made its most memorable appearance—is that they almost invariably involve trying to inflict the requisite massive amount of damage in a very short amount of time, hurriedly backpedalling away from the creature as it doggedly tries to deliver a thousand-volt smooch. It’s a Half-Life experience quite unique to Opposing Force, being one of the few times where outright retreating is more or less just a matter of course, and unsurprisingly, most of your arsenal isn’t suitable for a close-up with a bullet-sponge of this calibre. It’s a new type of challenge, and its arrival leaves openings for new solutions. And that’s why the Displacer Cannon, the funky experimental ball-lightning launcher so powerful it can backfire you into another dimension entirely, is Opposing Force’s best-designed new weapon, and its strongest showing against the expansion pack problem. 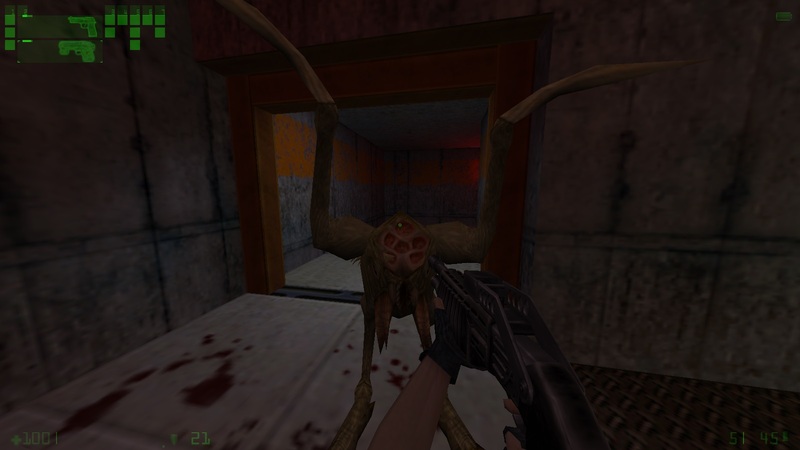 The Half-Life games have never really had much use for a last-resort, pull-the-trigger-and-everything-dies weapon—mostly because any pitched battle large enough to justify its use tends to go from ‘fine’ to ‘oh god, definitely not fine’ far too quickly—but the advent of the burly Voltigore calls for a devastatingly powerful single-target punch with minimal windup. What better option could there be than a projectile that literally deports whatever it hits back to the border world? You can be decisive with the Displacer Cannon because—unlike many of the weapons Opposing Force adds to the experience—it serves a role that is unique, distinct, and occasionally in very high demand indeed. It doesn’t intrude on the usage rules you developed over the course of the original game; it gives you an opportunity to create new ones. It also looks kind of like a BFG9000 when you fire it, and really, who’s going to turn that down? If you enjoyed this article, you can read more of David’s content on his blog. You can also discuss your own thoughts in the comments below. Follow us on Twitter @LambdaGen to keep updated with more Half-Life goodness. A Half-Life latecomer, David is a video game critic (well, he likes to think so) and an amateur mapper with a love for all things first-person. 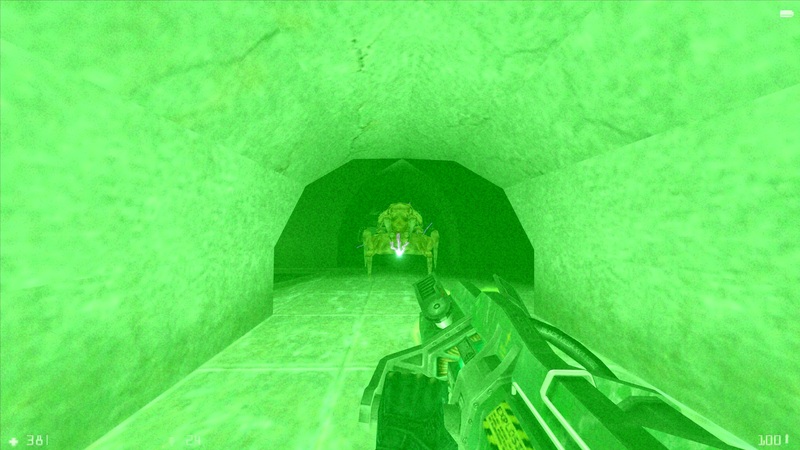 When he can, he runs @dot_bsp, showcasing GoldSrc’s forgotten worlds. One of the weapons/tools that I enjoyed the most when playing this game was actually the hookshot. Were it up to me I would have introduced it earlier in the game to help change the way half-life expects you to explore its world (adding in this case a whole new dimension of vertical maneuvering). Then again it makes sense they wouldn’t risk altering the original half-life formula too much. resulting in a higher dependence of the newly introduced weapons like the lungfish as compensation for the explosives. That is another potential solution, yes. Removing weapons and filling their roles with functionally similar replacements isn’t so much an expansion as it is a trivial alteration, though. I also have a feeling that gimping existing weapons that were present in Half-Life wouldn’t have gone down well with players who weren’t aware of the line of reasoning behind the decision.